Getting a handle on historic hardware styles. 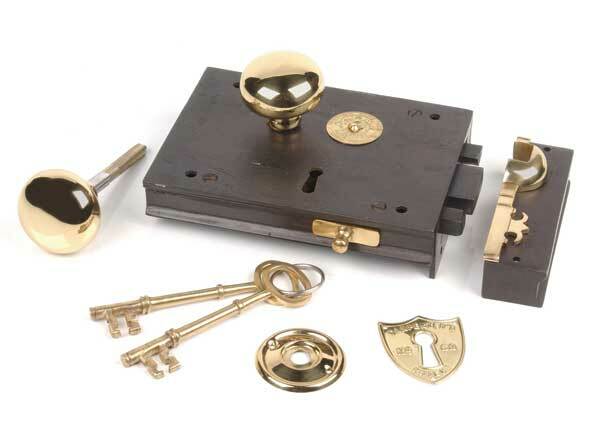 The &apos;Carpenters Rim Lock&apos; from Van Dyke&apos;s Restorers, in black and brass. Every house has doors, and every door has some sort of hardware that enables the user to open or secure it. The device seen on most new houses is the doorknob, but in old houses that might date back to the 18th century, knobs are far from universal. 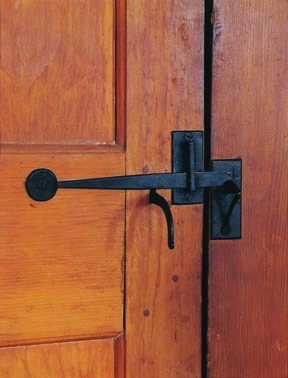 In fact, in old houses of any era or style, latch or lever hardware may be far more common. Understanding a little about what these three types of hardware are and where they come from historically can help explain where you&apos;d expect to find or use them in a pre-1940s house. First, a word about locks—those mostly invisible mechanisms operated by knobs, latches, and levers. Along with simple latches, rim locks or box locks that mount onto the surface of the door were the primary locks seen on houses from the early 18th century to about 1850. Before a lock industry fully developed in America, many such locks were imported from England. After 1850 box locks started to be replaced by mortise locks, where the lock slips into a pocket cut into the edge of the door and only the trim is visible. Mortise locks are still manufactured, but now are mainly used in commercial applications. Mortise locks were eventually superseded in houses by bored locks, which include tubular locks (developed by Linus Yale, Sr. in the late 1800s) and the cylindrical lock (developed by Walter Schlage in the 1920s). 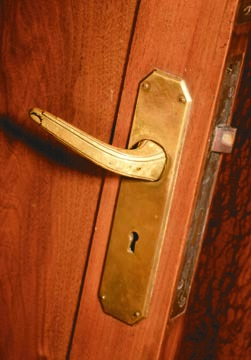 Since the 1920s cylindrical locks have grown to be the most common type used in residences due to their cost, relative quality, and ease of installation. 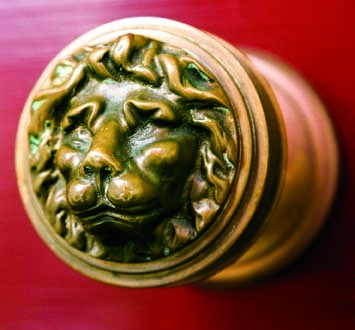 In the Victorian era, doorknobs and escutcheons, like everything else, went decorative. Knobs—spherical or oval handles—are unquestionably ubiquitous devices, although perhaps 80 percent of the knobs in pre-1800 America were imported from Europe (primarily England). Throughout nearly 300 years of use they have come in an amazing variety of materials. Some dating back as far as the mid-17th century were cast in early brass- and ironworks by whitesmiths. Unlike blacksmiths, who left the surface of their products much as they came from the forge, whitesmiths filed and polished their wares to a high finish. The cheapest knobs were made of clay. Known as pottery knobs, they came in three basic styles: mineral, porcelain, and jet. Pottery knobs, used on thousands of locks, were popularized by John Pepper in the 1850s when he teamed up with Emanuel Erwin (later of Russell & Erwin Mfg. Co. fame) to form The Mineral Knob Company. 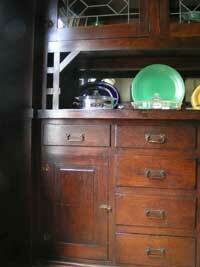 Equally widespread were wooden knobs, sold either stained or left natural. Better quality wooden knobs are securely fastened to the shank by hydraulic pressure and still function well today; cheaper versions are glued on and were considered undesirable even a century ago. Another inexpensive knob material was cast iron. While durable, iron knobs are not particularly stylish. 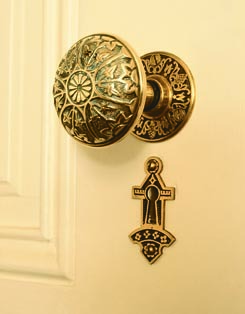 Stamped or spun metal knobs, however, often represent the peak of the decorative hardware industry and were made in an immense variety of styles. Knobs of brass and bronze are, outside of glass knobs, of the highest quality in terms of construction and ornamental design. These come in two forms: solid, cast-in-one-piece knobs, and composite knobs fabricated with wrought bronze or brass covering a steel frame. The most expensive knobs, generally, have always been the cut glass or crystal glass variety with their value, then as now, depending upon the grade of the glass and the amount of cutting involved. The inside of a thumb latch, showing the horizontal bar that lifts when the thumb lever on the other side is pressed. Latches—generally any simple fastening device—make up the oldest group of door security hardware and, in terms of handling, are typically operated by pressing a lever with the thumb. 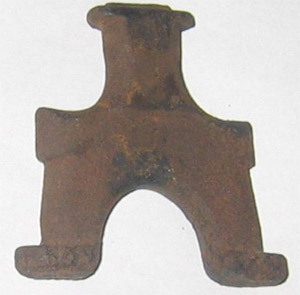 The earliest wrought-iron thumb latches are metal versions of the primitive wood-and-cord string latches used in colonial dwellings. Common and domestically made of iron up to about the 1820s, they contained no mechanism for securing with a key and were subsequently made obsolete by rim locks. Latches were probably considered too archaic for mass-producing through most of the mid-1800s, but the picture appears to have changed after the American centennial and the perfection of modern lock systems. Like knobs and levers, this beautiful hardware type went through a transformation in the 1870s, when they were usually cast in bronze or brass with figural motifs on the pull portion and matching back or door plate. Catalogs of entrance or store-door locks often refer to the large pull handles and thumb latches that are frequently seen on commercial buildings and large houses. Every period and style had corresponding hardware. This brass lever has a ziggurat design that marks it as Art Deco. Levers—horizontal handles of various types—originated in Europe, as did most door hardware. They became more common in America after 1890, often for buildings with a continental inspiration. Levers are usually cast in either iron or more expensive bronze. The designs can be simple or highly ornate, with swirling curves and matching roses. Levers, unlike knobs, can be handed, meaning they will only work properly if they are placed on either the right or left side of the door—an important point to remember when ordering hardware. Following knobs&apos; resurgence after the 1870s, levers have made a comeback since the landmark Americans with Disabilities Act (ADA) in the early 1990s. While those regulations only apply to public buildings, they have spurred a renewed interest in artistic lever design and all-around ergonomics. When surveying your old-house doors for the purpose of fixing or ordering hardware, it is important to note both the function and the hand, particularly when you are considering levers, some locks, and some types of hinges. The hand of a door is determined from the secured side of the opening, or from the entrance side of a door. As you are facing the door the side the hinges are on determines whether it is a right or left hand. So, if the hinges are on your right, it is a right-hand door. If you have to pull the door to open it, or reverse it, it is a right-hand reverse. If you simply push the door to open it, it is a right-hand door. Les Moore specializes in architectural hardware and security issues for the Saint Peterbyrne Institute in Long Beach, California.